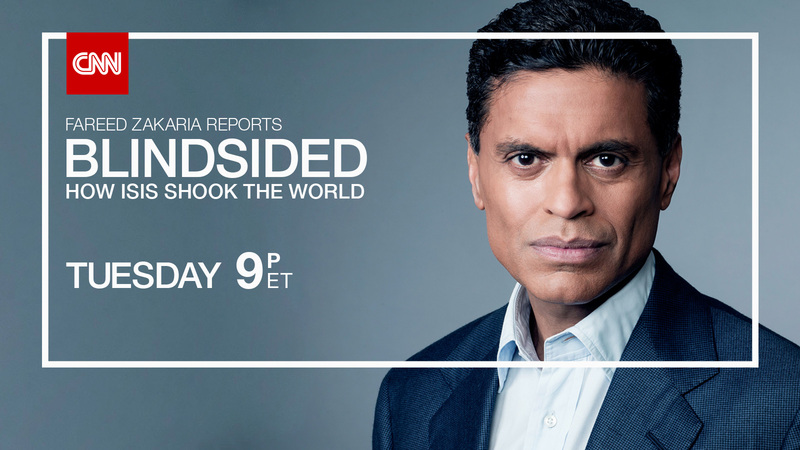 The origins of the terror group known as Islamic State or ‘ISIS,’ and what they want, are explored by CNN’s Fareed Zakaria, in a one-hour special, Blindsided: How ISIS Shook the World, tonight, Tuesday, Nov. 17 at 9:00pm Eastern on CNN/U.S. and CNN International. Deputy National Security Advisor for strategic communication Ben Rhodes; a former jihadi who now leads a counter-extremism think tank, Quilliam, Maajid Nawaz; former director of the U.S. Defense Intelligence Agency, Lt. General Michael Flynn; Middle East expert and London School of Economics professor of international relations Fawaz Gerges; former FBI agent Ali Soufan; and others discuss the ambitions and goals of the terror group. The chief objective of ISIS, or Daesh, is its unique vision of a caliphate – and luring American and Western troops back to the Middle East to apocalyptic ground in combat. Also discussed, how ISIS grew to become a transnational terror organization, how it recruits followers, what is being done to try to stop it – and what does and doesn’t seem to be working.